Lockers NYC| Lockers just arrived damaged? here is what to do| It can save you thousands of dollars if you handle the claim properly while the driver is still at your door. For all locker buyers, Particularly those buying off the internet. Many Locker companies on the internet are thousands of miles away. They do not know if you have a loading dock or need a liftgate to bring the lockers in, Or if your elevator or doors are wide enouph for the delivery. Unless you ask for inside delivery, The carrier will only bring them to the edge of the truck for you to bring inside. We strongly urge you to either ask for inside delivery upfront or higher an installer that installs lockers for a living. Lockers are heavy, They are easily scratched or damaged if your not careful. The biggerst tip we can offer and remember its free. Is when accepting a locker delivery inspect every box for visable signs of damage, If you choose refuse the shipment or sign the delivery ticket subject to internal inspection. Doing so will give you another 72 hours to carefully inspect the lockers. Above all if you see damage, Note it on the delivery ticket or the carrier will think you received the lockers in good condition and refuse the claim. While the truck driver is there, Call your supplier and let them know what just happened.﻿Gales (est. 1938) stocks and installs lockers in the NYC Metro area. Most projects are seamless enabling us to provide Lifetime Warranties on our Lockers and installations. But sometimes stuff happens. Large locker projects can be exciting, Lockers are typically ordered last. So the heat is on to delivery the lockers, build them and get out before the construction deadline arrives. On this particular job, Located in NYC historic West Village our guys arrive with the lockers. We are told on arrival the floor is not done and to store the lockers and comeback to install. As a precaution our Lead installer has the Construction Super inspect every locker to insure they have been delivered in good condition. A week later we get a call that several lockers are scratched (?). So out install techs are in the neighborhood installing shelving. They walk over to the locker job site to discover several groups of lockers with ladders chained to the locker legs. 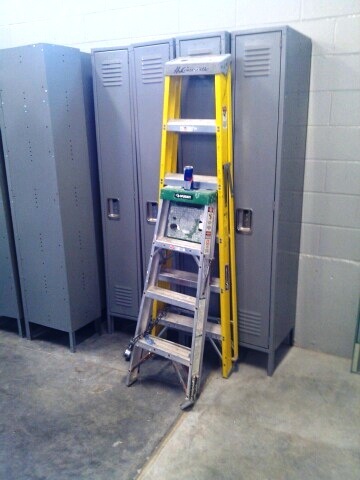 turns out another trade chained their ladders onto the lockers. Several aluminum ladders scratched the doors. The end user that is moving in next week expects perfect condition lockers. Thankfully a change order was written after we provided several pictures of our discovery. Gales extensive locker inventory made the change out quick. Waiting for replacement parts would have been another 6 weeks. Our Install guys are great they create lemonade out of lemons on every job. The GC was great and Gales was awarded 3 more Locker projects on the spot. Need assistance with Locker Selection, Layouts, Installations or Repairs ? Contact Gales Industrial today. Gales provides free on site layouts, Turnkey installations, Lifetime Warranties and Free inside deliveries.